EB103 is a biaxially oriented metallized polyester film developed for packaging applications demanding very high metal adhesion in addition to good barrier performance. The high metal adhesion ensures high lamination bond strength, whereas the high barrier performance protects the product throughout its targeted shelf life. 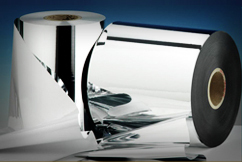 The metal adhesion to film of the Ester Metallised High Barrier Film EB103 is 850 g/ 25 mm. Therefore this product is specifically suited for applications, wherein metal adhesion is a critical factor and which affects the interlayer bond strength of laminate. A typical example is the performance of EB103 in solvent free lamination wherein interlayer bond strength drops significantly and EB103 helps in maintaining good bond strengths. In addition, this product finds usage in packaging solutions which require higher chemical resistance (like alcohol wipe test etc). The EB103 has excellent mechanical properties, flex crack resistance and excellent gloss. This film is available in 12 micron thickness. Very high metal adhesion, especially suitable for demanding applications. Exceptional barrier properties to oxygen and water vapor, to preserve flavor, taste and freshness. Higher flex crack resistance than aluminum foil and hence, better performance than aluminum. Easily process-able without loss of barrier properties. Consumer-friendly packaging: glossy, long lasting look and feel. Meets US FDA and EC regulatory requirements for food compliance. As a barrier layer in demanding applications like “Bag-in-Box” for wine packaging. Suitable for hot fill (85 - 95˚C) applications like liquid juices, jellies, tomato ketch-up etc. Suitable for applications requiring high chemical resistance.